September 21, 2015—Just like most people you know, everyone has a story. When it comes to cities and towns, they also have stories. I came across an interesting story about Hobbs, New Mexico, that I definitely didn’t know about. As a early adult I worked on a drilling rig in Albuquerque, working for a water well drilling outfit, Rodgers & Co., so I had a bit of interest about this story when I first came across the story, although drilling for water is a bit different. Most people in Hobbs probably already know the story, but for most of us New Mexicans that live in different parts of the state, this is something new, and a very interesting bit of New Mexico history. “It was desolate country – sand, mesquite, bear grass and jack rabbits. Hobbs was a store, a small school, a windmill, and a couple of trees.” – New Mexico roughneck. Many have called it the most important single oil discovery in New Mexico history. The Midwest State No. 1 well – spudded in late 1927 using a standard cable-tool rig – saw its first signs of oil from the Hobbs oil field at 4,065 feet on June 13, 1928. It was a long journey. “Finding commercial amounts of oil in southeastern New Mexico presented geologists with a perplexing problem in 1928 because the land was too flat,” noted an article in the Midland Reporter-Telegram. “Unlike much of West Texas, where surface formations gave the oilmen a hint of where underground formations might be located, the flat, level land in Lea County, New Mexico shared none of its deep secrets,” reported Bill Modisett in 2009. The area presented a special problem to geologists assigned the task of locating drilling sites. Since no surface formations were present to serve as markers of possible underground formations, much guesswork, possibly accompanied with prayers, entered into the exploration process. New Mexico’s first commercial oil well is drilled September 25, 1922, on the Navajo Indian Reservation near Shiprock by the Midwest Refining Company. The Hogback No. 1 well is a modest producer at 375 barrels per day, but Midwest soon drills eleven additional wells to establish the Hogback oil field as a major producer of the San Juan Basin. Two years later, a pipeline to Farmington is completed and oil is shipped by rail to Salt Lake City, Utah, for refining. But discoveries in southeastern New Mexico will overshadow the San Juan Basin’s oil and natural gas possibilities. New Mexico today is the third leading oil and natural gas producing state. It has produced more than 5.5 billion barrels of oil since the Hogback No. 1 well. Following oil discoveries in the Scarborough field of Winkler County, Texas, exploration for oil moved north and began in Hobbs in 1927, according to a local historian. The Midwest Refining Company, which would later become Amoco, drilled the Hobbs discovery well in a farmer’s remote pasture. The well was a cable-tool rig drilling challenge from the start. Disaster struck at 1,500 feet when exhaust from a Franklin 85 engine ignited the engine house, noted one historian. Fire quickly consumed the wooden derrick. “Men with less vision would have given up, but not the drillers of Midwest,” claimed Paige W. Christiansen in The Story of Oil in New Mexico. “A steel derrick from Amarillo, Texas, was set in place, the engine was rebuilt by local mechanics, and the cable tools were ‘fished’ from the hole,” he explained. After encountering the first oil at 4,065 feet in June, the well was drilled to 4,330 feet to increase production, according to the Midland Reporter-Telegram article. 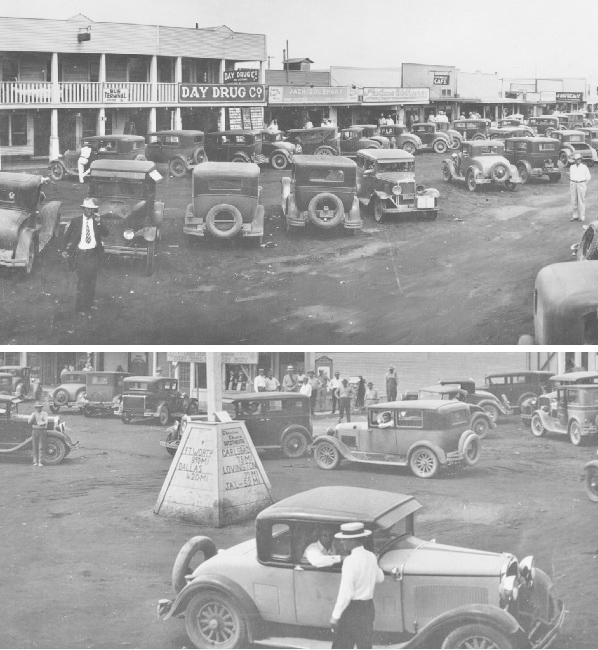 Production from the Hobbs oil field soon drew crowds of investors and encouraged further exploration, quickly transforming the town from “sand, mesquite, bear grass and jack rabbits” to the fastest growing town in the United States, according to the 1930 census. A second oil boom occurred in January 1930 when Humble Oil Company of Texas drilled a well three miles northwest of Hobbs that began producing a spectacular 9,500 barrels of oil a day. Humble Oil also introduced a new drilling technology to the field – the rotary rig. As the boom expanded, oil tank batteries were built and pipelines laid to transport both oil and natural gas. But there was a growing problem of getting petroleum to market. Relief came when the first train, operated by Texas & New Mexico Railways, arrived in Hobbs in April 1930. New Mexico has been a major producer of oil and natural gas since hydrocarbons were first discovered in the early 1920s,” according to the New Mexico Bureau of Geology and Mineral Resources. Although Midwest State No. 1’s production ended in 2002, the state remains a major producer. Ten counties today produce oil or natural gas, says the New Mexico Oil and Gas Association. Pipelines extend for more than 25,000 miles – exceeding the combined mileage of the state’s railroads and highways. In 2007, more than 1200 new wells were drilled and the state produced 1.6 trillion cubic feet of natural gas and 65.4 million barrels of oil. The Library of Congress American Memory collection includes photographs of Hobbs taken by Russell Lee and others for the Farm Security Administration. Although Lee visited Hobbs years after its first oil strike, his photographs capture this important New Mexico boom town. More New Mexico petroleum history can be found in Farmington, including the exhibit “From Dinosaurs to Drill Bits” at the Farmington Museum.